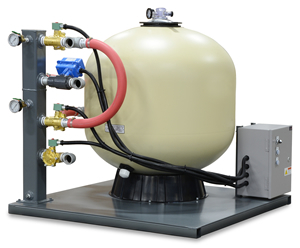 PM Series permanent media sand and gravel filters remove free floating solids from plant circulating liquids preventing blockage in manifolds and orifices located in process equipment. Three sizes are offered to allow tailoring to specific process requirements. Model PM-30 serves 100 - 199 ton applications and maximum capacity of 70 GPM. High flow rates for all models. Manual or automatic back flush cycles. Great for chilled water or tower water systems. Structural steel base with decking.